My aunt boiled the beets, cut them in chunks, doused them with a healthy amount of vinegar, salt, and pepper and one of my least favorite vegetables was transformed into my favorite new side dish. I loved them! Besides being tasty, preparing and eating them is fun! I love the way they bleed (I think they might be the perfect vegetable for halloween), and how everything they touch turns crimson (including your fingers and tongue). For some, this is a deterrent but the stains are temporary so why bother with the gloves! Get your fingers dirty, stick your tongues out at the table to compare colors, remember what it’s like to be a kid! But perhaps the best reason to eat beets is that they are very good for you. According to WHFoods.com, beets contain compounds that help protect against heart disease, birth defects and colon cancer. They are high in fiber and despite their high sugar content, surprisingly low in calories. Ok, now you know why I like beets but you’re probably still wondering why I would decided to combine them with chocolate and turn them into a muffin. Well I can’t exactly take all the credit for the idea. Once I realized that I no longer hate beets, I couldn’t wait to find some new recipes to try out. I started scouring the internet and was surprised to find numerous recipes for Chocolate Beet Cake. WHAT??? I certainly wasn’t expecting that. But the recipes are everywhere. Then I made another discovery. One of my favorite food blogs, La Tartine Gourmande, also featured a Chocolate and Beet recipe. I decided that if Bea thinks it’s a good combination, then it probably is! Instead of trying one of the cake or brownie recipes, I decided to modify one of my muffin recipes to create something sweet and chocolately that can be eaten with a little less guilt. I was hoping that the addition of beet puree would act much like the applesauce or banana that I like to use in my muffin recipes, replacing some of the fat and keeping the muffins moist. It worked! 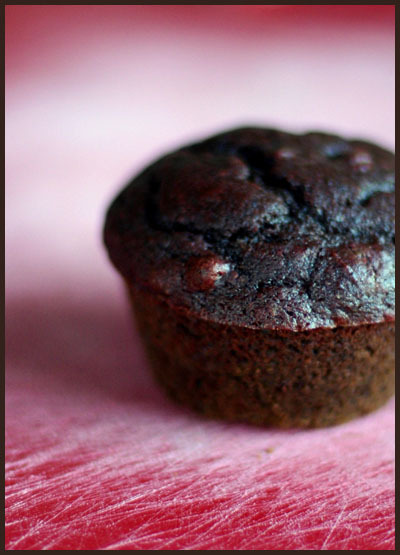 I used a bittersweet chocolate in these muffins both for the health benefits and because I thought the dark earthy-tasting chocolate would be the best compliment for the beets. I think it worked really well because these muffins don’t really taste like beets at all and unless you tell, no one would guess it! Now I wouldn’t go so far as to call these muffins “healthy.” But they taste great and are considerably better for you than a standard chocolate chip muffin and much, much better for you than a big slice of dark chocolate cake! But I’m including the nutrition data this time so you can decide for yourself. 2. Grease a 12-cup muffin tin or line it with paper cups; set aside. 3. In a large bowl, whisk together first 5 ingredients until well combined. Stir in the half cup chocolate chips and nuts; set aside. 4. In a small saucepan, melt the other 2/3 cup chocolate chips and butter over very low heat. Stir to combine and set aside to cool until lukewarm. 5. In a medium bowl, whisk together eggs, brown sugar, beet puree, buttermilk, vanilla and melted chocolate. 6. Pour the chocolate mixture into the dry ingredients and stir with a wooden spoon until just combined. Don’t overmix. 7. Immediately spoon batter into 12 well-greased or paper-lined muffin cups. Batter should completely fill the cups. 8. Place muffin pan in a preheated 375 oven and bake for 18-20 minutes. Muffins are done when they spring back when touched lightly in the center (or when a toothpick inserted in the center of a muffin comes out clean). Don’t overbake! 9. Cool muffins for 10 minutes in pan then remove them to a wire rack to cool completely. *Canned beets may be used in this recipe but I strongly suggest using fresh ones if possible. To prepare beets: Cut off the greens leaving about one inch attached. Don’t cut anything off the root end. Gently scrub the beets being careful not to cut the skin. 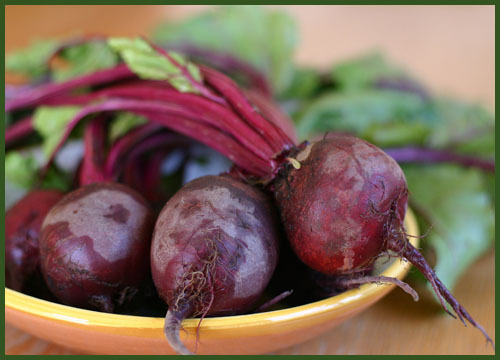 In a medium saucepan, cover beets with water, bring to a gentle boil and cook, covered, 30-45 minutes until tender. Drain and let sit until cool enough to handle. The tops should pull off easily or they can be cut off. The skins will slip right off. Puree beets with a little bit of the cooking liquid in a food processor until they are the consistency of applesauce. I love it!!! I would imagine that beets and chocolate would go so well together ... well done! Since B. hates beets and I love them, I wonder if this would work into getting him to eat some. I am happy to see you back! These photos are just gorgeous Nicole! I love love the first one. The contrast of the table (? )..I want the same one! And glad to hear you are now adopting this association. Beets are fun, aren't they? ooh, i was just thinking about chocolate and beets! Very nice! I recently made beet and rasberry muffins, yours are my next ones to try! Thanks! My aunt used to make a beet and chocolate cake. I'm sure these are similar....they taste really good. So glad you're back!My grandmother always canned beets, and we had beets and pickles with every meal all year. That's the only way I've ever had them, however.You gave me a new twist to try! Wonderful, you're back!!! I could definitely see this combination working, if carrot cake, zucchini bread, pumpkin muffins, etc are good, why not beets? I like beets, I like chocolate, you've sold me. Neat idea, I love beetroot! and I also love the idea of using vegetables in more dessert like foods and baking. Yum! Very interesting recipe... I want to try it soon, here in Sweden beet are very common and often eaten but I am not a big fan of them. Ciao. Thanks everyone! I'm pleasantly surprised at all the positive response to this recipe...I was a little afraid that it wouldn't be well received! I hope some of you try it! hi Nicole, what a great comb of flavours - I would have never thought of that(!) very original and I think it works very well! stunning pictures - *drool, drool* I would do anything to have one of these delicious muffins right now! Glad to see you back. I've seen those recipes around but so far haven't bit the bullet, or should I say, beet. I detest beets--I think they taste like metal. But...I'm always willing to try new things and your conversion is pretty convincing. And everything tastes better with chocolate, right?Also, it's already been said but...gorgeous photos! Hi, I just found your blog through Ivonne's site. It's great! I love hidden ingredients in food like that. The beets are a great alternate to bananas which obviously have a more distinct flavor. My mom used to use mayonnaise to make her chocolate cake moist, and I didn't know about it for years. Beets are a considerably healthier choice! Thanks so much for this recipe! 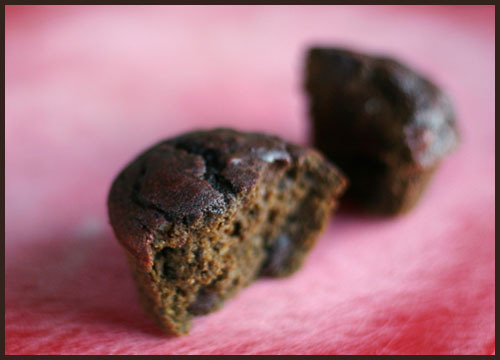 I've tried beet chocolate cake before, and I was wondering if anyone had a muffin recipe. They were great! I was too lazy to puree the beets, but around twice the volume of grated beets worked just fine. Thanks again! These look wonderful! I love chocolate and beets and I've been intrigued by the chocolate/beet cake recipes that I've seen around on other blogs. Thank you for sharing this recipe. Your photos are gorgeous! Beets are one of my favorite foods EVER. And chocolate comes in shortly after. I'm going to have to try this some time. This is great! I've been wanting to put beets into desserts for a while now, but you beat me to it (no pun intended), and I'm so glad you did! I just tried your beat muffins and boy was I surprised! everyone enjoyed them and people didnt even taste the beats! I have always thought that Beats tasted like dirt so i was wondering how this would tast but i will be making them alot more Thank you!!!! I have had this recipe printed out forever to make and finally made it last night. It was very good my 5 year old loved it and had no idea he was eating his vegetables. Thank you for posting it. I had never heard of sweet recipes for beets before and have garden excess to use up this was great. I baked these and topped them with cream cheese icing. Delicious! I left a few iced ones out and froze the rest (without icing). When I thaw a couple out I think I'll try to lighten up the topping by using whipped cream cheese instead of icing. Great recipe! I've got a batch of these in the oven right now. Was a little nervous because I've never cooked beets before, but the batter is a beautiful vibrant reddish looking color. Can't wait till there done.